We left something there. Will you ship it to us? What happens if I need emergency care while I am away? What happens if there is an emergency at the home I am staying in? What if I have some questions or comments? The deer are so tame! There are so many animals! What kind of laundry soap and cleaning products do you use? 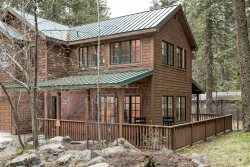 How do I go about picking the best cabin rental at Wallowa Lake for our trip? We would like to have someone make us a cake or cupcakes while we are staying at Wallowa Lake. Do you have someone that you recommend? What kind of cleaning and laundry products do you use? We need to leave a contact number for our dog/child/house sitter. Do the cabins have long distance or internet? Our house comes with a private boat dock, what information can you give me on this? Is it OK if I make payments? What if another member of our group wants to pay on the bill? I am paying by check, but forgot to mail in my final payment. What is the motel tax? What if I can't make it as planned? I haven't received a confirmation yet.........why? What can I do to help fit in with the local residents? I would like to make a reservation for next year, what do I do? Since you work from home, how will you respond if we need you? I smoke. Do you have any homes that allow smoking? I see that you have minimum stays.....can we come for less than your required stay? What happens if Mother Nature is in a bad mood? Unfortunately, we need to go home a day or two early. What happens to those open days? How do I know my reservation is secure? What if I have a winter cabin booked and the roads are so bad that I can't get there? What if I want to bring my pet for the next leg of our trip, but we have chosen a not pet friendly home? Ways to make your vacation PERFECT! What happens if I need assistance while I am at the house? We want to leave the house for the day, what should we do? Will my cell phone work up there? I haven't had time to prepare for my vacation what services do you provide to make it easier on me? Can I buy groceries there? My home is pet friendly, what are my responsibilities? What can you do if we have "Wildlife Experience" while at your cabin? Do you recommend anyone for a massage while we are there? What if I want to do some fishing....do you have any guides that could take me/us? What if we want to fly in to the Joseph Airport? Does Wallowa Lake Vacation Rentals have an office at Wallowa Lake? It is really late, and we forgot to put the map/key information in the car and it is past business hours what do I do? I forgot to put my map/key information in the car. What do I do now? When may I check into my cabin? I am paid in full and have received my final confirmation, now what? I have made my first payment, now what? I haven't received a confirmation yet........why? I am ready to make a reservation what do I do now? How strict are you on your minimum stays? HELP! You have so many that I am having a hard time deciding! What if I can only stay 1 or 2 nights? Do you know of other mountain retreats that we can visit on our way to you? Do you know of any other retreats that we can visit? We will do our best to locate and ship it back to you. You will need to provide us with a credit card prior to it being shipped back to you. We will charge for shipping the item back, as well as a $15 fee for handling. We have a full service hospital in Enterprise, about a 15-mile drive from Wallowa Lake. If you need help at your home, use the sheet inside your Welcome Book that has the address of the home, as well as local emergency contact numbers to the police, fire, poison control, etc. Call - 9 1 1 - just as you would in your home. Then, using your cell phone or a neighbors phone, contact us so we can figure out the next step. Excellent! Let us hear it! We love success stories and appreciate your taking the time to tell us how your family enjoyed their vacation here. While we strive for your total enjoyment, sometimes we need some feedback. We rely on your experience to improve if needed. We will also share any feedback you have with the homeowner. Wallowa County has a bunch of professional Realtors! We are happy to help you find the number of any the offices. Yes, the deer are quite used to people, but please do respect their space. While they appear friendly, they are wild animals and have been known to attack, gore, and chase adults, children, and pets. Do not feed the deer as they rarely want you to stop and can get quite aggressive. There are other wild animals in the Wallowa Lake area and the Eagle Cap Wilderness. They deserve a wide space and a healthy amount of respect. We know that people often find cleaning products and laundry soap scents to be offensive, so WLVR does everything we can to go scent free, however to keep the homes and laundry sanitary, we do have to use products that some people don't like the smell of. If you have a request, please let us know 2 weeks prior to arrival of your needs. There are a lot of options when you start looking for cabin rentals at Wallowa Lake. We are happy to assist you over email, over the phone, online chat,or thru email! We take great pride in helping you locate your perfect place and want everything to be perfect. You can help us by thinking on what part of the Wallowa Lake area you want to be on, special amenities you might require, and some dates. We are more than happy to talk about each cabin or home and help you find your perfect cabin! Wallowa Lake Vacation Rentals, Inc., was formed in 1998 when we were looking for a family friendly job. We wanted a job that the kids could be involved in and be with us. Little did we know that the business would boom as it has, and how many people we would need in our support staff to put it all together! We are so lucky to have a wonderful job that takes care of our family, but also to get the opportunity to make memories in your family as well! Thank you!! Yes. We can provide you with past clients, current clients, and future clients if you have questions as to our rules and procedures. Starter amounts of paper products and garbage liners, as well as the basics like coffee pots & filters, microwaves, toasters, dishcloths, towels, bedding (sheets, blankets, pillows), and bathroom and kitchen soap (no washing machine soap). You only need to bring clothing and food! Cabins are also equipped with either a propane or charcoal BBQ. If your home has propane, we provide the propane. If your cabin has a charcoal BBQ, you must provide briquettes. If your cabin has a fireplace, we provide the wood for you, with an axe if needed. We also try to list special amenities like cable, or VCR/DVD, on the website. If in doubt, email us! One hint for a great vacation? Throw in your own beach towels and lounge chairs. While we offer lawn furniture, they don't recline, and can be hard to take a nap in! Contact us. We can give you the number to leave behind with those that are taking care of things while you are away! Our phones have long distance blocks placed on them, but you may use a calling card from the home. For internet services, please check each individual cabin's page for their internet capabilities. Some of our houses have Wi Fi, and some have no access. There is always free internet service in Joseph or Enterprise at several businesses. If your home comes with a boat dock, that dock is private and only for your use. You will not have to share the dock with the general public, or the neighborhood, it is for your use only! Our docks are usually in the water by Memorial Day weekend, and stay until Labor Day. The exception to this rule might be if the weather has been so foul that we can't get the docks in the water (Spring) or the water level has dropped (Fall) due to irrigation or water levels of the lake. We will do our best, but some things are beyond our control. We accept Visa, Mastercard, personal checks, money orders, or cash. If they are paying with a Visa or Mastercard, please supply them with your reservation number. If they would like to pay by a check, please put the reservation number or your name in the Memo line. You can drop it off at our conveniently located office in Enterprise at 309 S. River Street, right past the Shell gas station. The drop box by the front door is clearly marked WALLOWA LAKE VACATION RENTALS. Please put your payment into the locked and secure mailbox located to the right of the entrance. Do not leave cash in this box. If you have a cash payment, leave it at Timberline Realty in Joseph at their front desk. You will be given a receipt here. Motel tax for the cabins at the lake is 6%. Tax in the city limits of Joseph and Enterprise is 9% (which Affects Units #5, 25, 26, 35, and 56 only). If you are paying with a Visa or Mastercard, you will need to call us 1 week prior to your arrival and give us your credit card information. If you are paying by a check, please mail in your check 7 days prior to your arrival. Please include either your reservation number or name on all correspondence. We email your information. We will never sell, loan, or use your information for any other purpose than for your reservation(s). If you fail to call us and your home sits vacant, then you will be responsible for the full payment. If you purchased CSA Travel Insurance, contact us and we will help you file a claim. If you provided us with an email address upon making your reservation, your confirmation was sent to that email. If your e-mail account uses a junk e-mail filter, please be sure to check your junk mail folder periodically as you await your confirmation. On occasion, we have heard from customers who did not realize that we sent them a reply because a junk mail filter intercepted our response. If you only have a snail mail address, then we will be putting your confirmation in the mail to you. To help fit in with the local residents, please keep to your own parking area, observe the quiet hours of 10 pm and 8 am, respect their privacy and their yards, and respect our rules of the house. Feel free to introduce yourself and make a new friend while you are here--but please do be considerate of them. We are thrilled that you would like to come back next year! Please contact us to make sure that your home is available. We typically renew contracts with our homeowners from July to October, and until we receive the signed contracts back, your reservation is considered tentative. Once we receive the signed contract back, we will get with you for your payment. Owners always have first chance to reserve their dates. You are always provided with our 24 hours a day, 7 days a week oncall service. If you need anything, we are available and always willing and able to assist you! No, unfortunately we do not. You are able to smoke outside, with a few rules: please pick up all butts and do not throw any on the ground; please clean up your ashtray before you depart; and please know that if there has been smoking inside the home, a fee of $250 will be automatically charged to your credit card to cover the cost of deodorizing the home. Sometimes. This is a gray area, and is based upon what the Owner of the home wishes. Some owners will take them without a short stay fee, some will take them with a small short stay fee, some require a 3 night stay. The best way to know the for sure answer is to call us. We are happy to help you! Unfortunately, we do not have any control over Mother Nature, the Tooth fairy, or the Easter Bunny. We are not able to refund money due to any issue that is beyond our control. If you purchased CSA Travel Insurance, please contact us if you need help filing a claim. We are sorry to see you leave early. Let us know ASAP. We will try to get your unused nights rebooked! If you have given us more than 30 days lead-time to your vacation, you will be eligible for a refund. If you are within 30 days of your arrival (including being here when you discover you have to cut your trip short), we are only able to refund when we can re-rent your days. If your home sits empty, the cabin's owner still receives payment for the entire reservation. Please consider purchasing CSA Travel Insurance as this often covers unaticipated expenses if you have to leave early. We have to respect the County and we have to respect the neighbors. If you have more than what is on the website, then contact us. We have overflow parking available. We operate on County permits, and we are strictly bound to regulations. If the home sleeps 10, that is the max. amount of persons that we can have on the premises. We are in violation of our permit if there are more people than allowed at the home at any given point. If your group expands, then we need to evaluate the situation and find a solution. Contact us; let's see what we can do for you! From the date you made your reservation, you have 10 days to mail us your payment, if you chose to pay by personal check. Your reservation is considered secure for these initial 10 days. If you chose Visa or Mastercard, your reservation is secure the moment we process your request. If the roads are closed, then we will work with you to chose different dates that you can come and enjoy the cabin! Keep close watch of tripcheck.com and keep in touch with us. Often the freeways are just closed for a short amount of time, and if you keep watch of tripcheck.com, you will know when you can head over to our direction! If you purchased CSA Travel Insurance, contact our office and we will assist you in filing your claim. Wallowa Lake Vacation Rentals is a home-based business. We rely heavily on the use of the phone. If you are experiencing an emergency, contact the numbers provided on your confirmation, or in the cabins. We have an excellent support staff of people that will gladly help you. No. All of our units and property are non-smoking. Before you leave for the day, please turn down the heat and turn off the lights. Visit our attractions page or the Wallowa County Chamber of Commerce. We also have a WELCOME notebook in your home for some ideas and activities. Maybe! Some companies (like Verizon) has great service at almost all of our cabins. Some companies aren't quite there yet. Visit our Concierge Services page for some ideas! There is Dollar Stretcher and Safeway in Enterprise, Mt. Joseph Market in Joseph, and a small store at the Lake. There are also convenience stores located at Enterprise and Joseph. Sorry, but we can't have outside campfires. You will be staying in a heavily wooded area, and fires can be very dangerous. •Keep the pooch on a leash while outside. •Keep the poo picked up and disposed of it by placing it in a small plastic sack, and put it in the garbage can. •Keep the pooch off the furniture and off the beds. •Do not leave your pooch in the home unless contained in a crate, and do not allow your dog to bark. •Read the pet policy on our website. If you are brining a pet, you are agreeing to the terms and conditions for any damages or waste left by the pet. *Consider purchasing CSA Damage insurance as this helps you incase your pet causes unexpected damage. Some of our units allow pets, some don’t. Contact us. We will need to know what kind, how many, and what unit you are staying in. About ½ our properties allow pets. Some homes do not allow pets; this may be due to new carpets, no yard for the pooch to do it's business, or the homeowners have strong pet allergies. Please respect the homes that have chosen to cater to the 2-legged vacationers and choose a home that wants to welcome the 4-legged vacationers. You are coming to Wallowa County, which has an abundance of wildlife. Please be respectful of them and do not make contact with them. Your wildlife encounters will hopefully add to your vacation memories, but if they detract, please know that we cannot control the wildlife. There are many things you can do while you are here! However, probably the best way to figure that out is to call the Wallowa County Chamber and have them send you a visitor packet. Some activities are seasonal, so make sure you check with that particular business. We do have a very comprehensive WELCOME BOOK in your cabin for your use while you are here! Mac from Eagle Cap Fishing Guides has taken many of our customers fishing on several different rivers/streams/lakes in Wallowa County. Mac is knowledgeable in the right bait to use, the best locations, and will gladly take you or your party fishing! Check out his website at www.eaglecapfishing.com . GOOD LUCK! We have two units that share a pilots-use car for your stay! Rent either #38 Arapahoe Lower or #41 Arapahoe Upper and have free use of a Mazda 626 during your stay. Pilots are asked to refuel the car on your way back to the airport on your way out. Contact us for more information! Wallowa Lake Vacation Rentals does NOT have an office at the lake--in fact, we are lucky enough to work from home. You must rely on the confirmation we provide you to find your home. If you need any assistance finding your cabin, please call the phone numbers listed at the bottom of your confirmation. We will be more than happy to assist you in any way! Call us. We have an answering service available 24 hrs a day, 7 days a week. We will gladly give you verbal directions to your home. Check out time is 11am. If you would like a later check out, call us. However, sometimes, we simply will not be able to extend the check out due to incoming guests. Before your departure, we ask that you strip your used beds, do the dishes and put them away. Leave the home in the general condition that you found it. But, you are on vacation after all, so enjoy the time you are here, knowing that your last day of leisure will not be spent cleaning. You may check into your home anytime after 4 pm. Use the directions outlined in your confirmation to get you to the home, and use the key code to get your key out of the box. Remember, Wallowa Lake Vacation Rentals is a home-based business, feel free to call us with any questions. If you arrive earlier than 4pm, we will gladly get you into the home as soon as we can. But it may take time to prep your home for your arrival. Because we want everything during your stay to be exceptional, we need the time to thoroughly clean your home. If your home is ready, we are happy to check you in early. If your home isn't quite ready, we will give you a time line for check in. We will, however, have your home ready for you by 4 pm! If you are here early, feel free to call us and we will see if your home is ready for you. Just count the days! Don't forget to pack your confirmation—it has very important information in it—maps, key information, check in times, etc. After we process your payment, you will receive a confirmation by email. If you do not have email, we will use snail mail, or fax. The next step will be clearly explained in your confirmation. Call 800.709.2039 or book online or email us at [email protected] and give us your reservation details. If you book online, be sure to watch the video, look at the pictures, and if you have questions about the style of home you are renting, call us! We are happy to help! Sometimes we can flex.....but this is a gray area and we take into account several factors. It is best to call us or email us so we can help you find the perfect solution to your shorter vacation needs! Let us help you! Call us and one of our reservation specialists will be able to help you decide upon your perfect home! We have all been into everyone of the cabins, and we are very familiar with location, amenities, and can help you find the perfect spot! It will be helpful if you have a couple thoughts ready when you call....specifically, dates, amenities desired, # of people in your party, or will you be traveling with pets. With just these few basics, we can help you narrow the homes down to a few to make your choice much easier! We are here to help, so just give us a call! Often times we can accommodate your stays of 1 or 2 nights. You might not qualify for our lowest rates, but the best way to figure out if this is going to work for you or not, is to call us. Often, we are able to accommodate your request, but give us a call and le'ts see if we can make it work! Do you know of other retreats that we can visit on our way to you? Yes! The Historic Mineral Lake Lodge located by Mount Rainer looks to be a perfect halfway spot to spend a day or two! Visit http://www.minerallakelodge.com/ . Their lodge looks fantastic!